A growing collection of small time-savers to enhance day-to-day productivity for developing with Visual Studio. Download it here, or from the Visual Studio Marketplace. 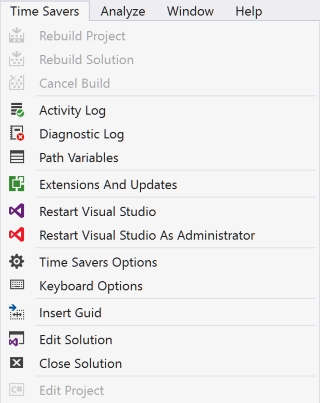 The simplest way of restarting Visual Studio on demand (normal and elevated). The simplest and fastest way of inserting a new GUID directly into your code, without leaving the code editor.